The ASUS DSL-N55U is a solid modem-router that offers dual-band Wi-Fi and excellent storage features. It has a well designed interface and it's a swift performer overall. We experienced a few frustrations with the installation of some of its apps, but it worked really well once everything was set up. We really enjoyed using it. Apart from its funky styling and a triple antenna array, what sets the ASUS DSL-N55U N600 apart from other modem-routers that we've tested is its interface. It has one of the more graphical Web interfaces we've seen, and we think it makes the N55U a pleasure to use — which is something we never thought we'd say about a router. The DSL-N55U N600 offers plenty of features that are sure to appeal to high-end users, and even small business users. It has Gigabit Ethernet, dual-band Wi-Fi, the ability to share a 3G or 4G mobile broadband connection, and, best of all, it features a swift and easy overall user experience. It's worth reiterating that we think this is one of the most user-friendly routers on the market. 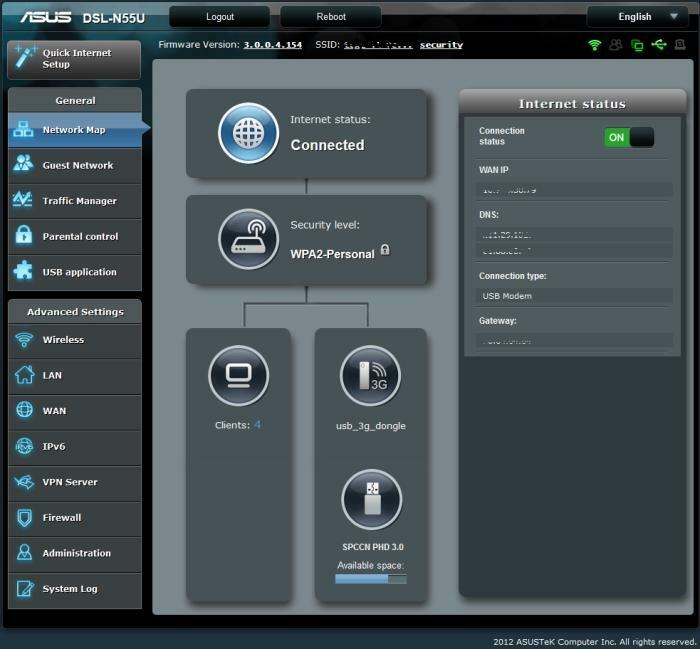 Its interface is what ASUS calls the 'Dashboard UI' and it's more graphical than other router interfaces we've seen before (the WD My Net Central N900 also has a similar graphical interface), with clear icons and an easy-to-understand layout. When you first log in to the router, the main page gives you all the details you need to know: are you connected to the Internet? What are your wireless network names and are they secure? How many devices are connected to your network? Are there any USB devices attached? All of this information and more is smack-bang in the middle of the screen so you can see, at a glance, what's going on with your network. Because the DSL-N55U N600 has a built-in ADSL2+ modem (it also supports 3G and 4G USB dongles as a backup), it's neat as far as cabling is concerned, and rather quick to set up. Once your phone and Ethernet cables are plugged in and it's switched on, all you have to do is log in to the Web interface (192.168.1.1 from any Web browser on a wired computer will get you there) and run the 'Quick Internet Setup' wizard. This will allow you to select your ISP from a drop-down list and, if it's on there, all you'll have to do is enter your log-in credentials. The next steps are to select names and passwords for your wireless networks. All up, we were up and running in a few minutes without any trouble. The main page of the Web interface is clean and gives plenty of information at a glance. For the months that we ran the DSL-N55U as our main network, it proved to be a reliable performer. Its interface was swift whenever we wanted to make any changes, and almost all of its features worked as advertised. In particular, it recognised and used our USB 3G modem after we configured it; our USB hard drives were perfectly usable as shared storage spaces on our network; DLNA worked flawlessly to stream content to our supported wireless devices; the FTP function turned out to be the best we've used in a consumer router to date. Its simultaneous dual-band wireless performance was also very good. We put it through our usual battery of tests in our standard test environment, transferring files from a wired desktop PC to a wireless laptop with an Intel Centrino Advanced-N 6300 Wi-Fi module. We tested over distances of 2m (our short-range test) and 10m (our mid-range test) for both the 2.4GHz and 5GHz bands. The router's 2.4GHz transfer rate in the short-range test was 8.86 megabytes per second (MBps), while in the mid-range test it recorded 7.43MBps. Its short-range performance is on par with high-end routers like the Belkin AC1200 (which got 8.87MBps in the same test), but it still doesn't come near the speed of the current champ, the WD My Net Central N900. In the mid-range test, the ASUS router's speed dropped a little to 7.43MBps, which is a little slower than we expected, but still decent. Interestingly, the ASUS has a feature called AiRadar, which, when enabled, is supposed to pick the most efficient route for the wireless signal to travel to and from your devices. This worked better in the mid-range test, where it boosted the transfer rate from 7.43MBps to 8.02MBps. We didn't record a performance gain from short distances when using AiRadar with the 2.4GHz band. At 5GHz, the ASUS put up a strong showing, recording 16.85MBps in the short-range test and 13.92MBps in the mid-range test. The short-range rate is a little slower than what the Belkin AC1200 recorded (17.6MBps), but the mid-range rate is faster (the Belkin got 12.18MBps). We didn't get a performance gain when using AiRadar with the 5GHz network; the short-distance test dropped to 15.6MBps and the mid-range test dropped to 8.55MBps. How the ASUS DSL-N55U N600's Wi-Fi performs will vary depending on your environment, but as far as we're concerned, when compared to other router's we've seen recently, its speed and reliability are very good. 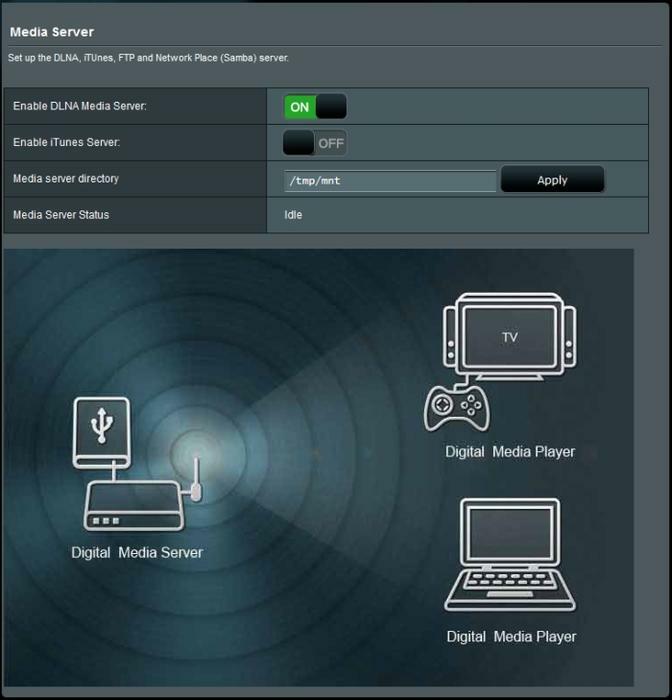 The media server function was reliable in our tests, allowing for smooth and easy streaming to our DLNA-equipped devices. We had no problems at all using this router to share content with DLNA devices on our network. In particular, streaming videos to a DLNA-capable TV was reliable and, most importantly, smooth. To do this though, we had to install the 'Media Server' app from the Web interface's 'USB application' section. File browsing on the attached USB drive was quick through a TV and the wireless network (both bands) was solid when streaming media from a mid-range distance. The success you have with this will depend on the distance and obstacles between your router and DLNA devices. The ability of the ASUS to share a storage device on a local network is excellent. As mentioned, streaming to DLNA devices was effortless with Media Server installed, and accessing content through computers on the local network was swift, too. What also impressed us greatly was the AiDisk feature, which is the FTP service that allows you to access your files from any computer over the Internet. This shows the USB applications that are installed. This shot is of a slightly older firmware version that doesn't have the Download Master and AiCloud apps installed. ASUS has made it extremely easy to give your attached storage device a URL through its own dynamic DNS service. All we had to do was pick a name, and it was set up almost immediately. We were easily able to log in to the drive remotely, and the responsiveness and reliability of the FTP service was excellent. On a typical ADSL2+ connection, we could download files over the Internet from a hard drive attached to the router at rates up to 90 kilobytes per second (KBps). We think it's the best FTP implementation we've seen as far as speed, reliability and ease of use are concerned. You'll have to make sure you apply a strong password to your user account though and not just use the default admin password. 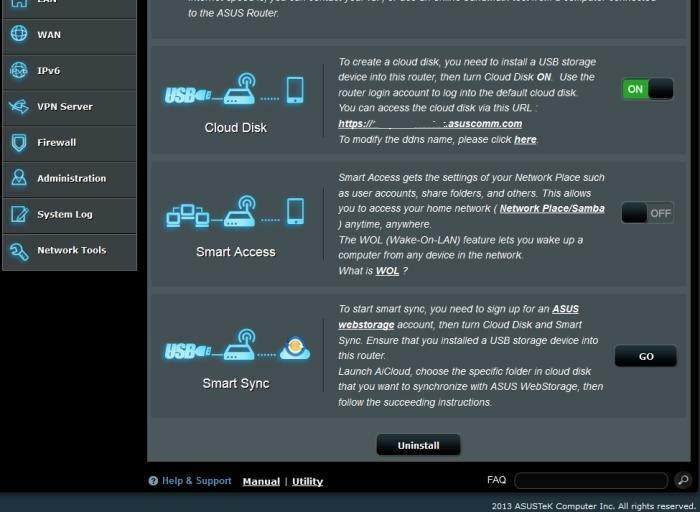 The router also has another remote access feature installed called AiCloud. AiCloud is an app that's listed in the 'USB applications' section, but unlike the Media Server app, it was a little fiddly to install. When we initially tried to install it, it kept telling us that the server was not responding. We had to restart the router a couple of times before it would install properly and let us enable all of the cloud features. You need to set up AiCloud in the router before you can use it to access content off attached hard drives remotely. You can set up AiCloud so that you can access files off attached hard drives remotely, and you can even enable access to other computers on your local area network. All this can be accessed through a phone app (iPhone or Android), which needs to be set up while you're still connected to the wireless router. 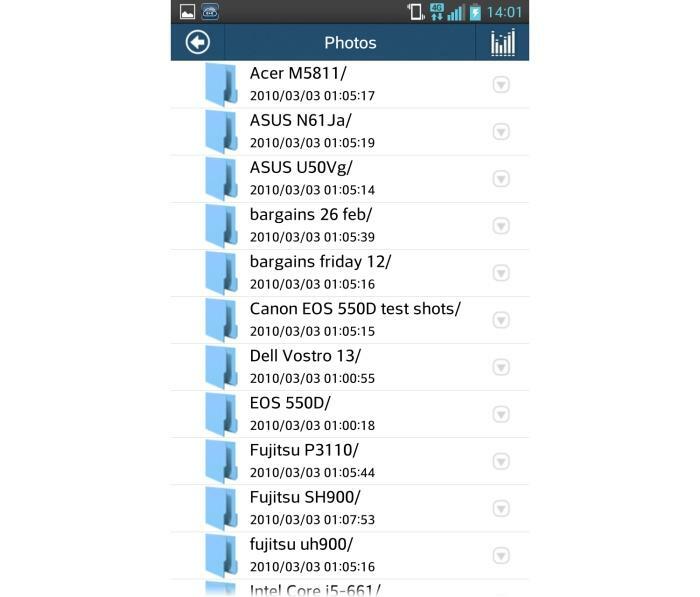 When it's all configured, you can use the AiCloud app to browse and download files remotely on your mobile devices. It's slow going for large files such as videos, even over Wi-Fi, so it's better suited to music and photos. To access files remotely, you do have to make sure that your dynamic DNS name is set up properly. There is a YouTube link in the router that goes to a help video with step-by-step instructions. 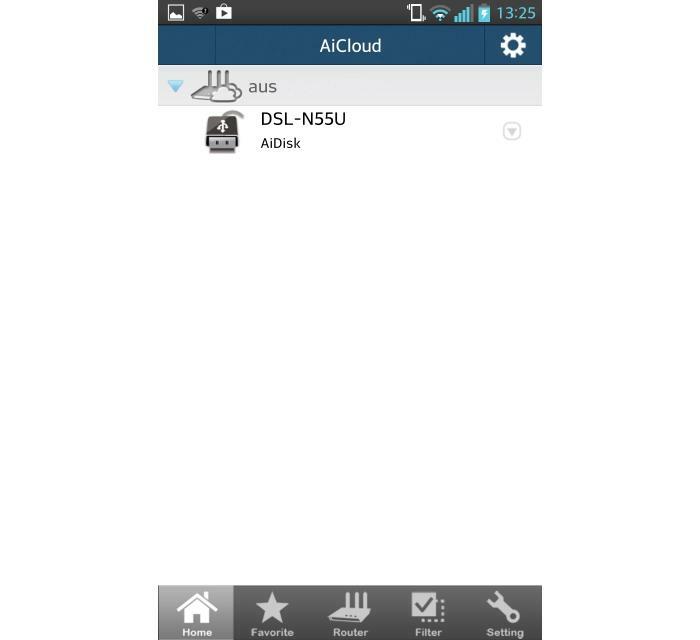 The AiCloud app works with iPhone and Android phones and allows you to log in to your router, or even access other computers on your local network, remotely. Here is a list of folders we browsed over a 4G phone connection. Other features of the ASUS DSL-N55U N600 include a BitTorrent client that lets you download directly to attached USB drives; there is also support for printer sharing, you get QoS, VPN support, IPv6 support, port-forwarding and other standard networking features, and you can also enable keyword domain name filtering. Flagged domain names won't bring up a message saying that they are blocked; in our tests, the router simply didn't load those URLs. There is also a useful traffic monitoring screen that shows you Internet and local traffic graphs. You can download torrent files directly to attached hard drives by using the router's Download Master application. Here is a download in action. You can monitor the performance of your Internet and local traffic easily. All up, the ASUS DSL-N55U N600 is a great little router that excels in storage support and data sharing, and it can be purchased for under $160, which we think makes it good value. Its wireless performance was relatively swift and very reliable and the router overall never gave us problems once it was properly set up. We did have to upgrade the firmware manually though (up to 3.0.0.4.364), because the automatic check through the router did not pick up the latest version (it only picked up 3.0.0.4.154). This is important because the latest firmware is needed in order to make use of the USB applications such as AiCloud, Download Master and Media Server. The default firmware for this router only came with Download Master and it was not until we updated that we were able to use the Media Server and AiCloud features. The only other issue is that installing AiCloud was a little fiddly and we had to manually reset the router a couple of times before it would work.